Genentech, Inc. recently became aware of the existence in the U.S. of a counterfeit drug product labeled as Nutropin AQ® 10 mg vials in 6-pack boxes. In cooperation with the U.S. Food and Drug administration (FDA), Genentech is informing patients, physicians, pharmacies and wholesalers about this serious health risk. The safety of our patients is of utmost importance and we are cooperating fully with the FDA to investigate this matter and prevent the further distribution of counterfeit product. 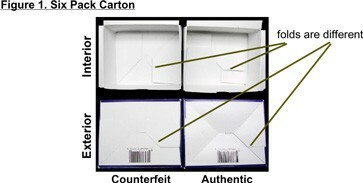 To our knowledge, the counterfeit product has only been found in distribution in the U.S. In at least one case the FDA has determined that a vial contained human insulin. In the event that patients have used the counterfeit product they should contact their physician immediately. The following information may help in determining if the product you have is counterfeit or actual Nutropin AQ® manufactured and distributed by Genentech. Pharmacists, all other health care providers and patients should examine the product before use. 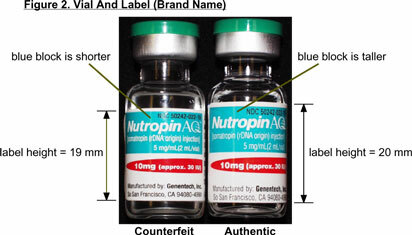 Below are a list of features to compare counterfeit product with authentic Nutropin AQ® with pictures illustrating these differences. Physicians, please convey this information to your staff and any others who prescribe this product so you can all help alert patients. If you, your staff, or your patients suspect that you are in possession of any counterfeit product, please contact your dispensing pharmacy or contact the FDA Drug Information Branch, Center For Drugs, at (301) 827-4570. 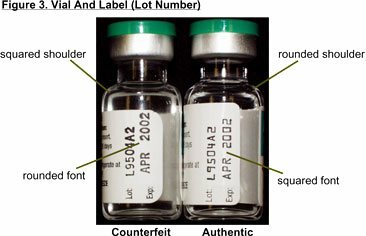 Distributors, if you receive any product that you suspect is counterfeit, quarantine it, store it under labeled conditions, and promptly contact the FDA Division of Drug Information at (301) 827-4570. Bottom outside back flap extends to two corners of the box (there are distinct differences). Regular stock paper is whiter and thicker. Dimensions are 11" x 7", unfolded. Bar code measure is 18 mm. Font (type) of lot number and Expiration date is different, with numbers zero, 2, 4, 5, 9 rounded. Print is darker and thicker. Height (width) of label is approximately 19 mm. Blue and red product blocks are shorter. Paper is off-white, thin, light-weight. Dimensions are 11.4" x 7", unfolded. Color of brand name flash is lighter. Bar code is wider and measures 20 mm. Font (type) of letters and numbers of the lot and expiration date is squared. Print is crisp and lighter. Height (width) of label is approximately 20 mm. Blue and red product blocks are taller. Shoulder is more square and higher. Width of vial neck is approximately 10.5 mm. Width of vial neck is approximately 9.9 mm. For lot number L9504A2, solution is cloudy at room temperature but clear when refrigerated. Underside of flip cap is smooth. After removing the flip cap, the top surface of the aluminum seal covering the stopper is indented with smooth even metal edge. Underside of flip cap has 6 notches. After removing the flip cap, the top surface of the aluminum seal covering the stopper is indented with 6 dents on the metal edge. 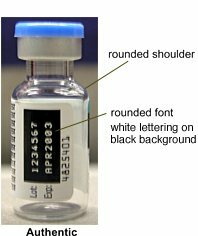 Portion of stopper inserted into the vial has an extra shoulder. Portion of stopper inserted into the vial is smooth. Nutropin AQ® is used for the treatment of growth failure due to inadequate endogenous growth hormone secretion in children and is self-administered daily through subcutaneous injection.